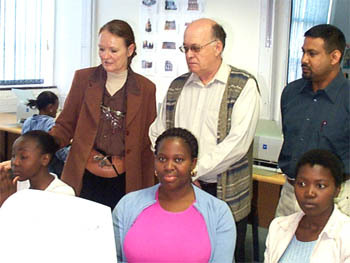 Professor Malcolm Wallis (centre), Dean of Commerce, being shown our IT laboratory by Mrs Wendy Gordon (Head of Department) and Dr Naresh Sentoo. 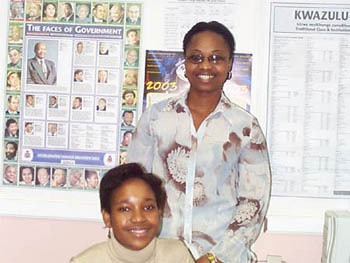 Experiential Learning 2003: Sthandiwe Nyawose with Librarian Thandeka Mapamulo at the Workers' College Resource Centre. 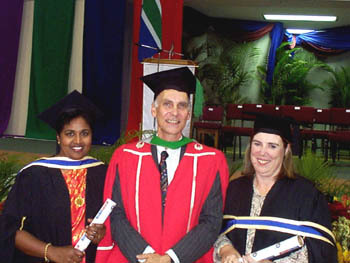 The iMEM Centre is the research and development unit of the Department of Library and Information Studies at the Durban Institute of Technology (DIT), South Africa. Its mission is to provide the resources and training to build ICT (Information and Communication Technology) capacity in South Africa. First and foremost, iMEM aims to bridge the digital divide and increase the competitiveness of South Africans in the Information Age. 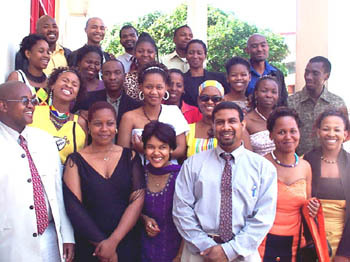 iMEM research and development activities build on a twelve-year track-record of success in the training of undergraduate information workers (librarians) with a strong emphasis on information technology. Our students have a good grounding in on-line and CD-ROM information retrieval and database design as well as multi-media within a library environment. In addition to their technological training, an emphasis on community information needs and outreach, together with regular exposure to local and rural libraries (through experiential training placements) produces graduates with a good grasp of grassroots community concerns and needs. We believe that skill in the creation of well-structured, accessible electronic information sources is the lifeblood of an emerging information society, so our projects seek to devise digital infrastructures to support various knowledge centred applications, ranging from community information networks and literary and cultural webs, to virtual classrooms.